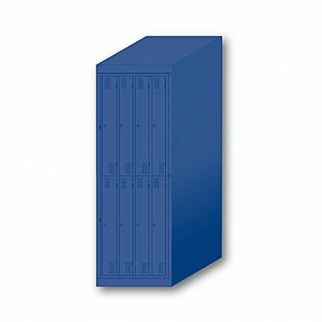 In order to keep your workplace clean and hygienic, you need a good locker system. Opt for Alsco New Zealand’s locker systems because they are made from high-quality materials which make maintenance a breeze. Durability and flexibility in one piece of locker. This hanging laundry locker features 8 doors for a larger place for your clothes. Cleaning these lockers and the space around them is easy. There’s no space between the locker and the walls, sloped tops prevent the dust from settling and it is raised, so you can easily reach underneath it. We also have the 6 Door Hanging Laundry Locker which is can provide ample space for storage. It’s durable and also raise the lockers by 150mm off the floor to allow easy cleaning and avoid dust settling due to carefully sloped tops.